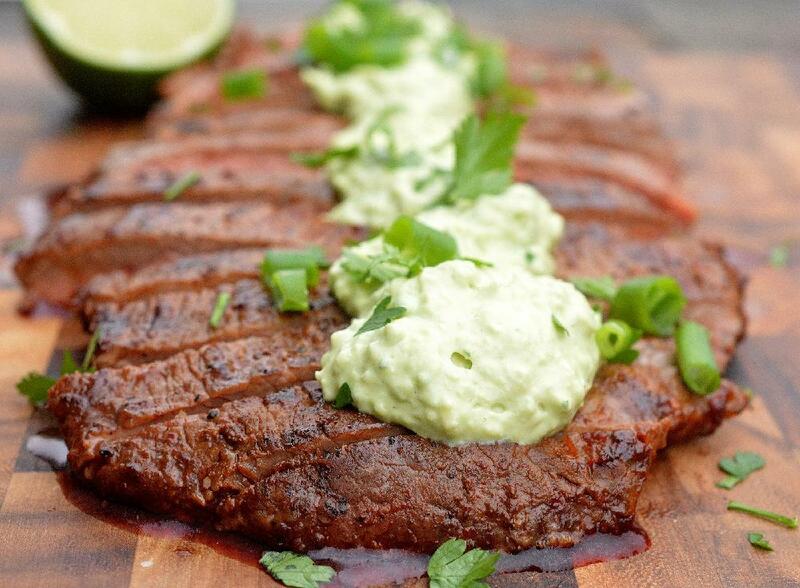 This Chipotle Grilled Steak with Avocado Cream makes for a great weekend or dinner party entree. 1 Season your steak with salt & pepper. 2 Pulse your garlic in your food processor until chopped, add the chiles and pulse until they are pureed, add in the molasses, honey and barbecue sauce and pulse until combined. 3 Pour over steak and rub it in evenly and allow it to sit for 30 minutes to 3 hours (covered in the fridge). Throw all ingredients into your food processor (or blender) and pulse until smooth. Adjust seasoning to your liking, then scrape into a bowl. Cover very tightly with plastic wrap (you want the wrap to touch the top of the mixture) and chill for 20-30 minutes. Grill steak on high heat until done to your liking. Allow it to rest for 10 minutes, tented with foil. Slice, top with avocado cream and some parsley or cilantro and enjoy!